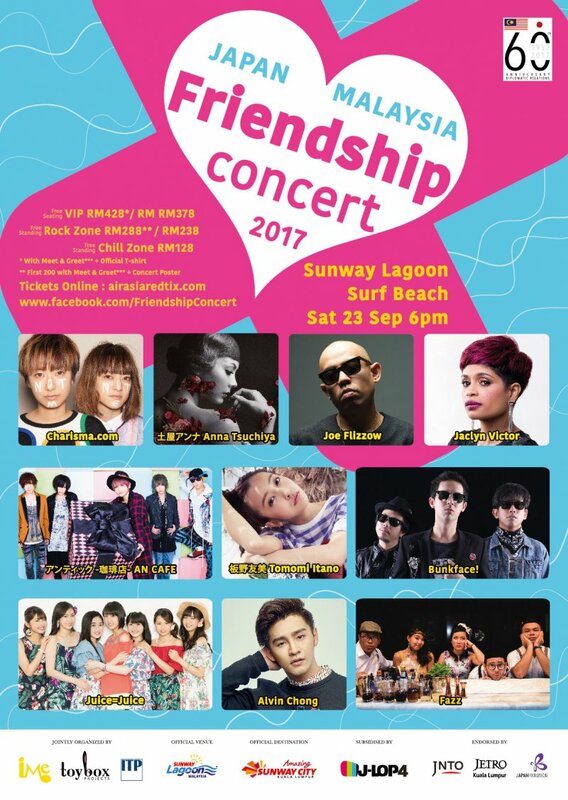 In conjunction with the 60th Anniversary of Japan and Malaysia’s business collaboration, a grand music concert ‘JAPAN x MALAYSIA Friendship Concert 2017’ will be held on 23rd September 2017 (Saturday), at Sunway Lagoon Surf Beach. Several Japanese and Malaysian artists will be performing to bring up an unique show! This will be the biggest ever concert involving major Japanese artists in Malaysia, and certainly the first of its kind to have a “Friendship” collaborations among Malaysian and Japanese Artists! Influential idols from Malaysia and Japan will gather for an outstanding performance during the event. Malaysian Rock Band, Bunkface confirmed join the event. They represented Malaysia to perform at Japan’s annual rock festival Summer Sonic Tokyo 2015, and also been to Ishikawa prefecture, Japan for the promotional travelogue, which many of the scenes of their hit song Darah Muda Music Video has been shot. With this concert, Bunkface is looking forward to expand their music influences further. An up and coming musical band, Fazz, who has performed in Haneda International Anime Music Festival 2015 in Tokyo, Japan and has toured Tokyo in 2016, will also be performing during the celebration event. Much awaited, popular Japanese Harajuku dance rock band – An Café, will be performing in Malaysia for the first time in their 14 years of touring worldwide and being internationally well-known. And electro/rap group – Charisma.com, consisting MC Itsuka and DJ Gonchi, who has been featured in Malaysian TV Program Mad Markets Hokuriku Special, a collaboration Travelogue by Japan and Malaysia, will also be performing in the event. The former member of AKB48, Tomomi Itano will be one of the performers. With her solo career after AKB48, Tomomi has became one of the fashion icon artists in J-POP scene. Celebrating the 15th Anniversary, the Queen of J-ROCK, Anna Tsuchiya, who is also a famous celebrity model and award winning actress will be joining the concert after receiving many requests from the fans in Malaysia. Anna’s hit song ‘Rose’ is very well known with the popular animation ‘NANA’. Japanese Idol group Juice=Juice, who has recently announced the 2 additional new young members confirmed to join. They will showcase the “Kawaii” stage representing J-POP Idols to Malaysia! All of the Japanese Artists joining this concert are performing in Malaysia for the first time. Besides that, Malaysian Artists Jaclyn Victor, Joe Flizzow and Alvin Chong are confirmed to be participating in the event. Jaclyn Victor who was the winner of the Malaysian Idol owns a strong foundation in her vocal skill that helps her shines throughout her journey. ‘Apa Khabar’ sung by Joe Flizzow, a Hip-Hop rapper artist, gained 800 million of views on YouTube and was nominated on several international music awards! The reputation of sunshine boy, Alvin Chong who is currently embarking the Malay market, is increasing rapidly. His appearance in this event will attract many fans attention and support. ‘JAPAN x MALAYSIA Friendship Concert 2017’ is jointly organized by IME Malaysia, Toybox Projects and Ishida Taiseisha Inc and will be attended by both the respective countries, thus securing the bond between Japan and Malaysia and enhancing the music culture understanding among both countries. This event is endorsed by Japan Embassy, Wisma Putra, Japan External Trade Organization (JETRO), Japan National Tourism Organization (JNTO) and Japan Foundation. The festival will be joint by Japanese prefectures and audiences will also be able to enjoy finding out more about Japan. Ticket price for the 4-hour concert is RM428 (VIP Free Seating, including Meet & Greet Pass and Official T-shirt), RM378 (VIP Free Seating), RM288 (Rock Zone Free Standing, with First 200 Early Bird including Meet & Greet Pass and Concert Poster), RM238 (Rock Zone Free Standing), and RM128 (Chill Zone Free Standing). All ticket prices are inclusive of 6% GST, but exclude RM4 processing fee. Tickets are available starting from 8th August 2017 (Tuesday), via Redtix online website https://airasiaredtix.com/ , for enquiry email to support_redix@airasia.com. For Japanese speaking, enquiry can be made to info@toyboxprojects.com and 6012 330 3108 (Toybox Projects Hotline).